The Irish were not meant to be a permanent work force in early Lowell. The area, which would become the manufacturing Mecca of America, had recently been purchased from the farmers and landowners of Chelmsford by the Boston Associates as part of their dream of creating a mill city on the Merrimack. Their dream was large and necessitated a work force to dig canals to bring power to the mills and to build the workhouses of red brick. Kirk Boott, the man who was chosen to build such a place, met with one Hugh Cummiskey, a native of County Tyrone, Ireland, in a tavern in what would be the new city in the year 1822 to strike a deal. It was agreed that Cummiskey would bring a crew of laborers up from Charlestown to the city-in-waiting to provide the labor necessary. So begins the traditional account of the beginning of Lowell's Irish community. There was prior to this a small body of Irish who worked in the area on local farms or the glass works in Chelmsford. Therefore it is with Hugh and his sturdy workers that the story begins. Those first laborers made their dwellings in an area that came to be called the Paddy Camps and later the Acre. Their numbers began to rise and soon there was a permanent population here. Not a very welcome thought to some of Lowell's Yankees. Surely there were deaths within the Irish population during these early years, but no records exist of any certain Irish burials in Lowell. One reason for this would be that since many Irish were Catholic, they would want to be buried in grounds that had been consecrated by the Church. With the appointing of Father Mahoney as a permanent pastor to the growing flock and St Patrick Church being opened in July of 1831, the Irish had become a permanent part of the city's landscape. The conditions under which the Irish worked and lived would be substandard in today's vision. The few early accounts of life in the Acre tell of poor housing, crowded and unsanitary conditions. One early writer recalled pigs running through the streets. Some who died during this time were often brought to Saint Augustine's Cemetery in South Boston or Bunker Hill Cemetery to be interred there. One of Lowell's pioneer Irishmen, Denis Crowley, often accompanied the body on the trip. Mr. Crowley would later be buried in Saint Patrick's. It is possible that some were buried in the cemeteries kept by the town. The Town of Lowell kept two cemeteries in the area, one being along Boston Road (Gorham Street) known as Number Two. The Irish may have started putting their dead in a tract of land that runs along the side of Number 2, now called Old English Cemetery. There is one stone in Saint Patricks which gives the date of 1829, three years prior to the Cemetery's formal establishment. It seems certain that the stone was placed there much after the burial and whether the burial was at that place is questionable. A day similar to yesterday. Rev'd Mr. Mahoney arrives from Lowell & states that a burying ground has been purchased close to town on the road to Bilricky & that it is in every respect a desirable spot for the internment of the dead. He states farther that Kirk Boott Esq'r has given another Lot fronting the Cath church for their better accommodation. In the early days there was no charge of any kind connected with burial in the Cemetery. When death came to any member of Lowell's little catholic community the relatives of the decease might secure a burial place for the asking. Friends of the family dug the grave and bore the body to its last resting-place. The Cemetery then was nothing more than a field set apart and dedicated to burial purposes. This is highly contrasted to other burial grounds such as the Lowell Cemetery, founded nine years later in 1841, which followed a growing trend of cemeteries not only being used for burials, but also as a place for walking and enjoying nature's beauty. Saint Patrick's was very much a working person's cemetery. The Cemetery expanded rapidly. Within the first decade another acre and a half was added. Father John O'Brien is mentioned in Bishop Fenwick's diary of 1866 for adding onto the cemetery again. It was at this time that the new areas were being laid out in a "checker board" style. This was a rather utilitarian style and greatly detracted from the natural setting. Roadways were straight and very often lost possible burial space because of the layout. Plantings were rarely taken into account. The styles, designs, and materials used for the monuments changed with the times and the economics of the population. Marble replaced the dark slates and later granite markers replaced the marble except for the carved angels and elaborate crosses and other designs that could only be carved in marble. Unfortunately for us today the white marble is affected by air pollution and is often hardly visible to the reader. In contrast a slate stone, which can predate the marble stone by two or three decades, is still legible. Though the Cemetery was taking on a more formal appearance, accurate records were not kept. Very few records remain from these early years of the Cemetery. Detailed record keeping did not begin until 1895, a fact that greatly disturbs many who are doing genealogical research in the Cemetery. The records that do exist prior to 1895 are in no defined order, difficult to read, and do not contain much information as to who is buried where. Very often only the original lot owner is listed. The burial records often contain scant information and some times do not even list the place of burial. Possibly no formal records were kept. Some records were kept by individual funeral directors. Perhaps some of these were never passed into the Cemetery. A fire at Saint Patrick Church in 1904 was also another possible cause for the record's disappearance. The Cemetery grew along with the city. After the Civil War, French-Canadians from Quebec started working in the area. Though they shared the Catholic faith with the Irish, tensions appeared tight between them. Articles ran in the local newspapers of 1893 stating that "no one but an Irish Catholic shall be buried in future in the potter's field." No reason was given for this "unusual arrangement", but the consequences were severe. It was directed towards the French-Canadians who it seems the Irish were afraid that they were filling up their cemetery. The only alternative at the time was burial in Edson Cemetery, which meant unconsecrated ground. 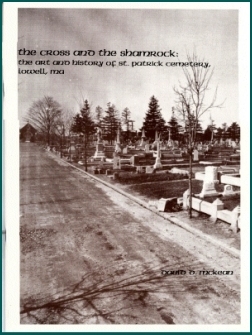 Shortly after that article appeared banning anyone but "regular Catholics" from burial at Saint Patrick's, another ran stating that Father Garin of Saint Joseph's Church, ministering to the French community, had purchased 30 acres a few miles beyond Edson Cemetery in East Chelmsford for the French Catholics. The lot that Father Garin turned over to be Saint Joseph's Cemetery was originally meant to be a summer residence for the Oblate Fathers who were serving in Lowell. Father Garin died the following year and was one of the first to be buried at Saint Joseph's Cemetery. Another Catholic cemetery was incorporated a few years after Saint Joseph's. Saint Peter's Cemetery (no connection with Saint Peter's Church) was a privately owned cemetery that ran along Boston Road between Spencer and Manchester Streets abutting Saint Patrick's. The land was privately owned by Misters Donovan and Grey. The history of the cemetery becomes a little shadowy as the years pass. It seems that on several occasions Father Michael O'Brien, Pastor of Saint Patrick's Church and Director of the Cemetery, attempted to buy the land from the two men. Since he did not meet their price they continued preparing the land for burials. Conditions between the two factions worsened over the years. Prices at Saint Peter's were far lower than Saint Patrick's. Rumors were spread that burial in Saint Peter's might not be acceptable to the Church. More unsuccessful attempts at a buy out were made by Father Micheal's successor, Father William O'Brien. There was even a time when Saint Peter's was mysteriously being taxed by the City of Lowell as agricultural land though burials were taking place. Again rumors were spread that officials of Saint Peter Cemetery were selling the same lot to two different people. Saint Peter Cemetery finally was incorporated into Saint Patrick's in 1911. In the far corner of Saint Patrick's is a gate rusted shut for many years. It is known as the Suicide Gate. In a time when psychology was a new field, people did not understand diseases of the mind. One who took his or her own life was believed to have had committed a grave sin. Burial in consecrated ground was not an option. Instead the body was brought in the back gate in an area set off from the rest of the Cemetery by trees and empty of markers. The practice of having such a gate does not appear common in other Catholic burying grounds of the period. It does show a sense of compassion for the families knowing their loved ones would still be near them. The gate is no longer used today. The only evidence of it being used as a burying place are the depressions which dot the area. Next to Suicide Gate is the Saint Vincent de Paul area, also called the Poor Ground. The unbaptized infant, the poor, and the unknown were given burial here. The open grassy area is marked with a single stone bearing the name of St Vincent de Paul. The Cemetery has never turned anyone away from being buried in this area. This practice is carried on today. It is the quietest and somehow the most peaceful area of the cemetery. About the time of the turn of the century a letter appeared in the Lowell papers stating what a disgrace and an eyesore Saint Patrick's had become. The writer noted how maintained the other cemeteries in the city were being kept and questioned the upkeep of the property. In defense of the Cemetery it should be noted that Saint Patrick's did not receive the funding that city cemeteries did. Paying the workers, buying new equipment, and caring for the upkeep of the property all came from the sale of lots. A Perpetual Care fund was begun in 1898. The idea of Perpetual Care was new and at that time still voluntary. Depending on families for the upkeep of lots was not working as it had been in the past. People's attitudes and schedules were changing. The first depositor was Mary A. Plunkett of Mount Washington Street. Mary deposited $1 00 "to pay the interest on the deposit each year to the Pastor of Saint Patrick Church, Lowell, Mass. for the care of the family burial plot in Saint Patrick Cemetery." Mary Plunkett died the next month at the age of 36. A Cemetery official wrote that her payment of the Perpetual Care fund just prior to her death was an "act of God." Later in the nineteenth century, family lots were purchased and the care of these graves was left to the individual family. Some families, to define their lots, elevated the ground, surrounded it with curbing and, in many cases, erected wrought iron fencing and gates. It was customary during these years to make visits to the gravesite, frequently a Sunday activity was to cut the grass and stroll the grounds. The trolley line ran along Gorham Street, making visitation easier and even a funeral car was added to the trolley line. Photos of Saint Patrick's Cemetery taken in the 1920s show a rather dismal view of the grounds, some graves receiving meticulous care, others over- grown. The policy at this time was that lot owners had free reign with the condition of their lots. This led to excess in some areas. The next decades would bring quite a change to the cemetery. As the lower and middle classes, that had been ignored socially and politically, gained power and influence, their monuments and markers became more imposing and elaborate to show their status and heritage. A number of stone carvers established their firms along Gorham Street to display their wares adjacent to the cemeteries. Among them were such firms as Mahan and Meehan. One generation came to Lowell to cut the stone for canals and buildings. Their descendants discovered a profitable line of work in creating memorials as the Irish became successful and emulated what they saw in other cemeteries. A beautiful addition to the cemetery was that of the chapel of Saint Bridget. Father William O'Brien often traveled home to Ireland. It is said that on one of his frequent trips he saw a chapel that he wished to have built as his own tomb. With the expansion going on in the cemetery, the time was right. The chapel and adjoining holding tomb were to be the centerpiece of the new area opening behind it. Made of stones taken from a local quarry, it reminds one of the Gothic oratories, which dot the Irish landscape. The connecting tomb was meant for use during winter burials. In the floor of the chapel an elevator lowers to the receiving tomb which could hold 300 bodies to await spring burials. (The practice of holding bodies is no longer needed with the advancement of equipment that can dig through the frost.) The dedication ceremony by Cardinal O'Connell was a major event in the Memorial Day weekend of that 1922. The Cardinal first visited the grave of his parents and then proceeded to the dedication of the chapel "in the names of Saint Bridget and Saint Patrick." The paper included a description of the six stained glass windows in the chapel donated by local undertakers and monument makers. They also commented on the mosaic floor and marble walls. It was considered the finest building for its purpose of its day. The next year Msgr. William O'Brien would die and his body placed under the floor of the chapel, which he had built. Many lots had become neglected over the almost 100 years since the cemetery was opened. The curbing surrounding family lots and the raised beds made it difficult to maintain. The decision was made to grade the Cemetery. This meant that the granite edging and the entire surface was to be leveled. The undertaking was massive. Much of the old curbing, which marked lots, was removed during the re-grading of the Cemetery. Each summer a crew of 18 to 20 men was hired to re-grade about 1000 lots per season. Yard One, the oldest part of the cemetery, would be most affected. The slate stones placed there by the pioneers of the last century were laid flat to help make mowing easier. The marble stones of the next generation were also laid on the ground. The granite curbing which surrounded many family plots was cut and the family name placed in the ground. Ironically the flattening of some of the stones has saved them from the effects of acid rain. Between 1926 and 1936 many improvements were made to the Cemetery. The old wooden fence, which surrounded the property, was replaced with a metal fence and new gateway. Portions of this fence still exist today. In 1928 a new service area was added to store equipment. Many roads were re-paved, plantings added, and concrete burial containers were required, replacing the wooden boxes, which could collapse. Some of the curbing, which was removed, was cut to help build the exterior of the present office, replacing a wooden edifice, which preceded it. That building was moved across the street and still exists at this time. The new office, enhanced by a working fireplace, supplied much needed space for records and included a beautifully paneled waiting room for out of town attendees of funerals. A portrait of Cardinal O'Connell holds a place of honor over the mantle. The last expansion of the Cemetery was begun in 1936. Then Superintendent John Meagher, who had succeeded his father Dennis Meagher as Superintendent, proposed to open the last untouched area of the Cemetery that ran from the Chapel to Boston Road. A whole new philosophy of Cemetery design had developed since the gates were first opened. Mr. Meagher referred to portions of Saint Patrick's as having the appearance of a "stone yard." Earlier superintendents did not have the foresight to see the Cemetery as anything more than a burial ground. Mr. Meagher took into account the contour of the land when designing roadways. Instead of straight roads meeting at ninety-degree angles, he designed wandering paths. Noting a trend in cemetery design replacing many closely spaced monuments with a single large monument with many flat stones, he designed the area for future shrines to be installed and included plantings separating one area from another. By 1946 the re-grading and many other renovations begun two decades earlier were completed. The Cemetery had been converted from a "stone yard" to a "source of consolation and inspiration to those who visit, not only for our generation, but those to come." It was also at this time that it was noted that the Cemetery was quickly filling with no room for expansion. A search for new land was begun by Monsignor Hyder who was Director and the Pastor of Saint Margaret's Church. In 1960, Saint Mary's Cemetery was opened in Tewksbury by Archbishop Richard Cardinal Cushing. Though few new lots currently remain at Saint Patrick's, future burials in owned lots will continue for many years. Unknown they may be now and forgotten by all but God yet the earth above their narrow cells is as sweetly beautiful as love and reverence can make it. None can say of us that we have failed in this final debt of Christian duty. And so long as time endures, God helping, no effort will be spared to perpetuate this tribute of loving veneration. 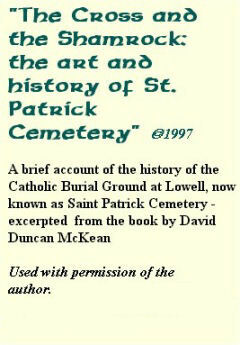 Saint Patrick Cemetery is the second oldest Cemetery in the Archdiocese of Boston. It is the consecrated place of rest of more than one hundred thirty thousand who have gone before us. They are our mothers, fathers, founders of our community, those who helped define who we are. And some are known only to God himself. The Cemetery that is today is a monument to those who have gone before us, a lesson for the current generation and a treasure for the future.